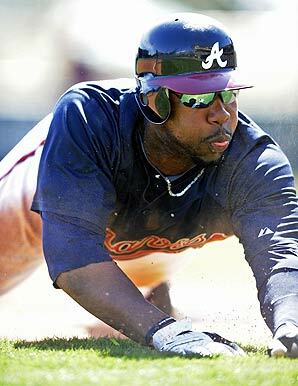 Jason Heyward the rest of his career. Something tells me that Buster wont be bothered at all if he doesn't take home the Rookie of the Year hardware, since he'll be getting a World Series ring in April. It will be interesting to see if his leadership characteristics and winning will continue for the Giants, leading to more Jeter comparisons. That would be amazing for Giants fans, and for the rest of us could be a little fun for a while. Strasburg was given an opportunity in the Big Leagues, and he didn't miss. In a National League rookie class for the ages, there is no doubt that Stephen Strasburg would have won this award had he stayed healthy. There was talk that he could be in a discussion for the CY Young award, even if he only pitched around 100 Major League innings, since we all seemed so certain those future innings pitched would be sparkling. In twelve Major League starts, Stephen Strasburg pitched 68 innings, giving up 56 hits and 17 walks with 96 strikeouts. The Nationals went 8-4 in his starts, and his last three starts of the year were after a DL stint and probably shouldn't have even happened. In the toughest sports market un the United States, Ike Davis provided a steady presence, displayed a winning attitude (for whatever that's worth), and played what seems to be much better than average, perhaps even world class defense, at first base. In fact, he lead all National League first basemen in UZR by a lot. his glove than his bat. So, there you go, Mets fans. The next time an obnoxious Phillies fan gives you a hard time about how much the Mets stink, you should tell them that Ike Davis is the best defensive 1st baseman in the National League and Ryan Howard is the worst. Oh yeah, and you may also mention that Ryan Howard turns into a really dreadful player if the Phillies are facing a lefthanded pitcher. Oh right, and don't forget that Ryan Howard has one of the worst contracts in all of baseball as he is owed 20 million dollars each season in 2011, 2012, and 2013 AND 25 million dollars in 2014, 2015, and 2016. Ryan Howard is still a good player, but he's not getting better. Ryan Howard turns 31 years old on Friday, and the Phillies will be paying him $145 million (with his $10 mil buyout) for the next six seasons. It's not much, Mets fans, but there is something there. "Como se dice 'new helmet'?" Batting Average is a lame statistic with deep rooted ties to the ancient box scores and the heyday of baseball cards. Still, Starlin Castro is still four months away from being 21 years old, and he hit .300 in the Major Leagues in over 500 plate appearances. Being so young last season, it would not have been a terrible disappointment if young Starlin had been overmatched. Instead, he showed flashes of brilliance and certifiable skills while resembling the natural characteristics of a kid who's still learning to play the game as a professional. Even as a Cubs fan, I was surprised that Castro persuaded me to include him on the ballot. Initially, I thought I was going to vote for one or two of the Marlins' Logan Morrison, Gaby Sanchez, and Mike Stanton. LoMo didn't play in enough games, Gaby just missed getting in ahead of Ike Davis and/or Starlin Castro, and Mike Stanton needs to show me even more before I can overlook his 34.3% strikeout percentage. Honorable mention: Gaby Sanchez, Mike Stanton, Logan Morrison, Pedro Alvarez, Jamie Garcia, Mike Leake, Jonny Venters, Madison Bumgarner, and Tyler Colvin. Who? What? What's a John Jaso? 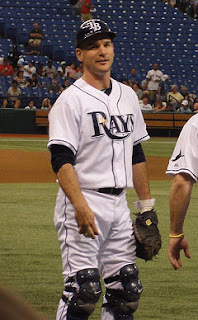 He was a key part of the Rays successful season. When Dioner Navarro and Kelly Shoppach brought basically nothing to the team this year, John Jaso stepped in and produced wonderfully. The Rays won baseball's best division, the AL East, and Jaso was 4th on the team in Offensive Wins Above Replacement behind Evan Longoria, Carl Crawford, and BJ Upton. Jaso had a .372 OBP and 110 OPS+ while playing Catcher and Designated Hitter for the Rays. nominated for Rookie of the Year? The Minnesota Twins needed a third baseman this year, and Danny Valencia was a key reason the team didn't fade last summer and won their division. He only played 85 games, which hurt his case, but his 116 OPS+ and .311/.351/.448 triple slash line were very impressive. On the defensive side, a 5.9 UZR in 709 innings played at 3rd base is excellent. The short explanation on why we don't support Austin Jackson for Rookie of the Year is too many strikeouts. Period. He did have a very good season for the the Tigers, when you think of him as a 23-year old rookie playing Centerfield, with 48 XBH, 27 stolen bases, and a 102 OPS+. Much like how we penalize Mike Stanton in the National League for his K%, Austin Jackson strikes out over 25% of the time and has an unsightly ratio of 170 strikeouts to 4 Homeruns. This offseason for the Orioles is a critical franchise defining juncture. They have young, talented pitchers. What is unclear is how good they'll be, and if it will be enough to compete with American League superpowers (Bos/NY) other emerging young pitching powerhouses like Oakland, Tampa Bay, and Toronto. It took a while for Matusz to blossom in 2010. He had his struggles all summer long, but was much improved once the calendar flipped to August. Even with his struggles, he finished the season with fewer hits allowed than innings pitched and a ratio of 63 walks to 143 strikeouts. There were a couple of other rookie relievers who really impressed us, but we decided to recognize Neftali's ability to take over the closer's job for the AL Champion. Daniel Bard and Sergio Santos are going to be outstanding relievers for years to come, but Neftali had the more remarkable season. All three of these guys had very good strikeout and radar gun numbers, but Neftali differentiated himself with his control. 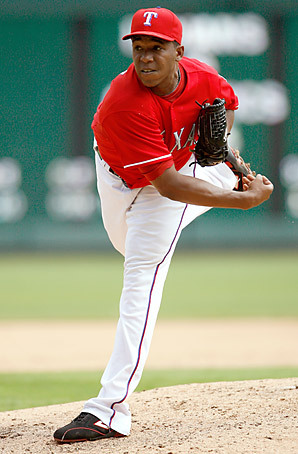 Neftali Feliz's K/BB ratio (3.94) was much better than Bard (2.53) and Santos (2.15). Honorable mention: Brennan Boesch, Wade Davis, Daniel Bard, and Sergio Santo.